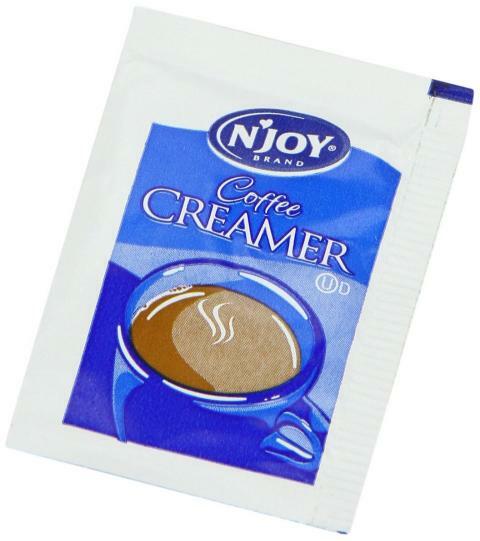 One packet of non-dairy, powdered coffee whitener. Each packet contains 2 grams ( 0.07054798144 ounce ) of whitener which provides 10 calories. 1 envelopes makes a singles serving. Corn Syrup Solids, Partially Hydrogenated Soybean Oil, Sodium Caseinate ( A milk derivitave ), Dipotassium Phosphate, Sugar, Mono-and Diglycerides, Artificial Color, Sodium Stearoyl Lactylate, Soy Lecithin, Artificial Flavor. Not a source of lactose.